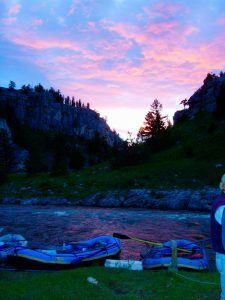 Sunset on the Smith River with Lewis & Clark Expeditions Outfitters (aka Healing Waters Lodge). Five day-4 night float down 59 rivers miles with the largest outfitter on the Smith. Call Mike Geary for details, 406-459-2030. Photo taken by Gearboater Extraordinaire (and all around great guy), Jensen Howard.